from tiggz Link for which i want to thank him again !! graphics and ideas...so a lot of credit must go to tiggz as well !! there are 2 skins in the zipfile a horizontal and a vertical skin. is located in the top right corner of the e-mail window on both skins. well that's about it i guess......enjoy !!!! Always nice to have a second option to use aside TIGGZ's other GREAT stuff..
i've been waiting for this baby! Nice job, Ozzy. Tiggz must be proud. Wow... fantastic. I had a GT3 Sysmetrix in the works, but I don't think it was going in the direction Tiggz wanted. This one is much better anyway. Great job! nice job ozzy, im glad you also did a hor. version. Great job again and thanks for sharing. I want to thank you both for making this. I like it verry much! Beautiful work. Thank you! I was waiting for a matching Sysmetrix skin. 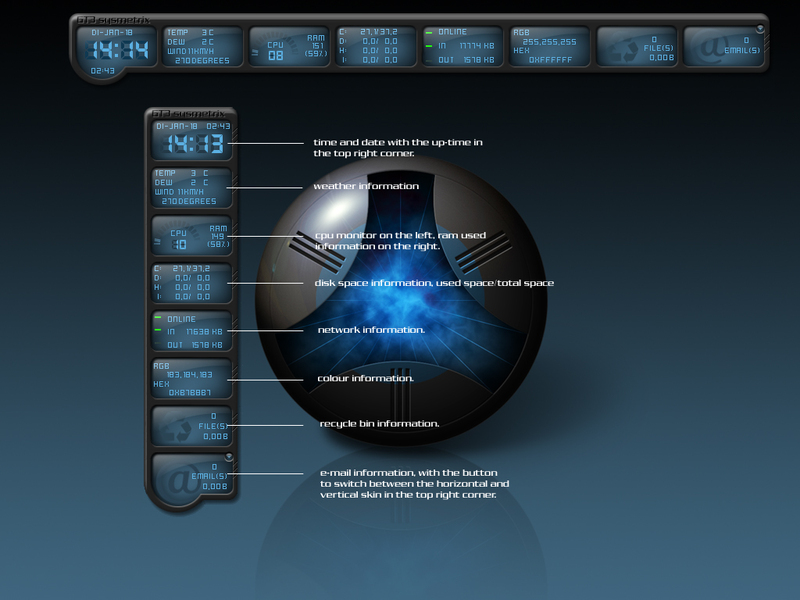 The widgets are great, but I'm really a Sysmetrix fan. The whole suite is superb and this is a great addition. Very well done! Thanks for making this one! but the GT3 skin. Again, GREAT job! It really compliments Tiggz's skins. Oh, I DID save it this time! A very worthy compliment to the series - I very rarely use Sysmetrix anymore - but if I did this would be a regular feature.